Salem Dahlia A., Egypt (Region Africa) - bpw-leadershiplifelonglearnings Webseite! Task Force Member (Region Africa). Dahlia Salem is graduated from faculty of Economics and political Sci. Cairo Univ. She worked as a banker in Commercial international Bank then got married and moved to Holland, Ethiopia and then South Korea. In Ethiopia she worked as a volunteer in the UN Women’s Assoc. She also participated in several sessions of awareness for teenagers. She wrote an article “Lack of Communication between Teenagers and their Parents“ published in the Newsletter of UN families on Dec.2002. She participated in cross-cultural debates with different nationalities in South Korea. She also attended the 6th African Congress for Women Entrepreneurs organized by EBWA in 2011 and wrote the conference report. At the German School in Cairo she presented a session “How to avoid Culture Shock” in 2012. 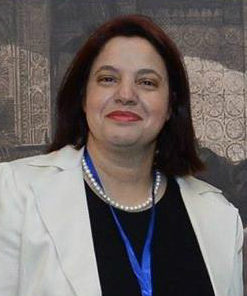 Currently she is a member of the Board of Directors of Diwan of Knowledge for Cultural Development Assoc.